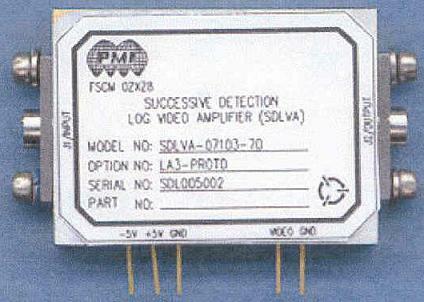 The Model SDLVA-07103-70 Option LA3 is a Successive Detection Log Video Amplifier (SDLVA) that operates over the 750 MHz to 1.25 GHz Frequency Range. This SDLVA offers 70 dB High Dynamic Range (Minimum) and a Nominal 20 MHz Video Bandwidth. Log Linearity is ±1.5 dB from the best fit straight line over the dynamic range of -65 to +5 dBm. 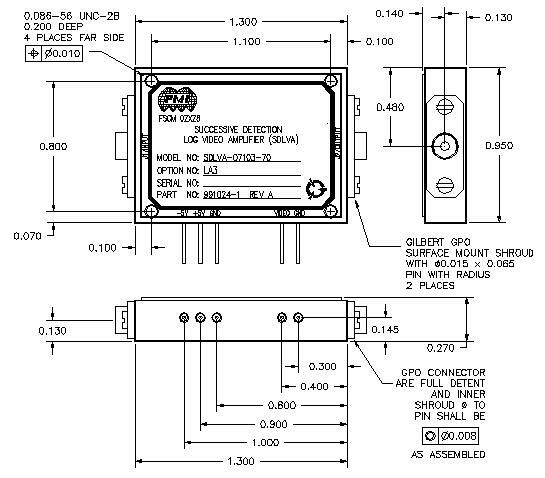 Size 1.30" x 0.95" x 0.27"
Test Data on 750 to 1,250 MHz, 20 nS High Speed, 70 dB Dynamic Range, Low AM/PM Conversion Successive Detection Log Video Amplifier PMI Model No. : SDLVA-07103-70-LA3.